If you somehow missed the news, Christian Music star, (during the years 1998-2002ish), Jennifer Knapp announced last week that she is re-entering the music scene after an seven year hiatus. Perhaps even more surprising is her announcement that she is a lesbian. 1.) The media is using Knapp to taunt Christians and test their response to Knapp's announcements. This really isn't about Knapp's "orientation." It's about grinning in the face of those who believe that homosexuality is a sin and seeing what kind of response they can rile up. 2.) Christians will not know how to respond. I'll use the term "we" here and say that Christians reading this announcement are, first of all, likely stunned. And when we're stunned, the typical response is to want to run and hide somewhere and pray desperately that someone else will stand up and take the heat by speaking on behalf of us all. We're relieved when this happens. Relieved we weren't called on to give an answer. Relieved when we don't have to be "the bad guy" who is taking the heat. Let someone else do that. So we find ourselves reading about Knapp and catching up on her news in the quiet and safety of our own homes, grateful that no one knows how much (or how little) we know on the subject matter. If they don't know what we know, then they can't ask questions. Jennifer Knapp will also be left alone as a result of our silence. The quicker this will all blow over and Christians can breathe a sigh of relief (mostly.) The situation will have various effects and most of all we Christians will be sad. We won't have learned anything. Jennifer Knapp will not have learned anything either. I think that one sentence and admission says it all. I am not here to debate homosexuality. Today we have a Bible that is three words long: "God is love." Everything else has been thrown out. We've forgotten about His holiness. We don't know the meaning of true grace. We've long since forgotten His faithfulness to us and not unlike the children of Israel - we're wandering in our homemade wildernesses. We compartmentalize our sins instead of lumping them all together and calling them out for what they are. We want to segregate ourselves so that we can be among those who are "understanding" of ourselves. So we ask for the Church of Homosexuals, the Church of Prostitutes, the Church of Those With Foul Mouths, the Church of Divorcees, the Church of Angry People, the Church of _______ (you fill in your own blank.) Even The Church Where You Win a New Car (and feel good about yourself while doing it!) Instead of learning how to be the body of Christ in the way that it was designed to operate - with everyone learning to live and function together, utilizing the gifts and pointing out the flaws in a loving (but firm) manner - we're begging for sympathy. We've built for ourselves a sympathy god but we've failed to realize that that god is ourselves. We're falling apart at the seams and we don't even know it. We ask for understanding and we find none because we're seeking wisdom from imperfect sources. But then along comes CNN and they have something to say to us, something to use as a weapon to jeer at our belief system. I don't really feel like they are deserving of an answer. Sometimes we are to answer the fool according to their folly and other times we are not. Right now CNN is the fool that doesn't deserve an answer and so this post isn't directed at them. This post is directed at Christendom who does need to learn to give an answer. We've lost our footing, not necessarily because it's been taken away - but because we've given it away because of fear, pride and any other number of sins. We each have our sins but do we even know what they are? How can we as Christians become more Christ-like if we are not examining ourselves in the light of scripture? Do we even know that when we become Christians we are saying that we want to be like Christ? And to be like Him, we have to know Him. And to know Him is to learn that there are right things and wrong things. There is such a thing as holiness and there are things that offend it. There is truth and untruth. There is justice and injustice, mercy and grace AND love .............AND holiness. 15What then? Shall we sin because we are not under law but under grace? By no means! 16Don't you know that when you offer yourselves to someone to obey him as slaves, you are slaves to the one whom you obey—whether you are slaves to sin, which leads to death, or to obedience, which leads to righteousness? 17But thanks be to God that, though you used to be slaves to sin, you wholeheartedly obeyed the form of teaching to which you were entrusted. 18You have been set free from sin and have become slaves to righteousness. 19I put this in human terms because you are weak in your natural selves. Just as you used to offer the parts of your body in slavery to impurity and to ever-increasing wickedness, so now offer them in slavery to righteousness leading to holiness. 20When you were slaves to sin, you were free from the control of righteousness. 21What benefit did you reap at that time from the things you are now ashamed of? Those things result in death! 22But now that you have been set free from sin and have become slaves to God, the benefit you reap leads to holiness, and the result is eternal life. 23For the wages of sin is death, but the gift of God is eternal life in Christ Jesus our Lord. We are still called to know what sin is and to avoid it. It is a gift to be forgiven. A gift - so none of us can boast! And when we are given a gift we should want to say, "Thank you" to the giver. In this case, the giver asks for obedience to Him and unless we know what His rules are, we will have no ability to obey. We have to know the rules, folks. We have to study and understand. People will continue to question our faith and their own and we need to be ready to give them solid answers to their questions. Can you do that? That's exactly the question I'm asking myself. It's the question we as Christians should keep asking ourselves until we're willing to discipline ourselves to know God and who He is. Jennifer Knapp is not the first person to raise issues over what Christianity is, nor will she be the last. But she can prompt us to get back down on our knees to pray for wisdom to know what to say, when to say it, and who to say it to. She could be just the encouragement we need to re-open the Word of God and discover what it says. She could be just the prompter we need to stand up for what we believe in. Or we could return to our quiet, private lives and keep pretending to ourselves that everyone likes us all of the time. Whether or not we decide to stay mum and hide, the fact remains: the truth will never change. This is great!!! Thank you for sharing your thoughts. I wondered which of my blogging friends would tackle this, and I'm not surprised that you are the first. Yep, not me. Pathetic that I feel I cannot put my own thoughts and God's Word into action. Thank you for a well written article to help us know ourselves and our sin better. PS. I did read the Christianity Today interview over the weekend. I was surprised at the language used in one of her songs...but I am sensitive to it. I do think it shows a person's heart. Very well-thought out post to you. I provided you a linkback. Very thought-provoking. Thanks for posting. Excellent post, Carrie. I, too, saw this news over the weekend, and read the CT interview yesterday. I'm grieved, but not entirely surprised by the fact that she can't "get into the theological argument" regarding her admission. I recently had someone in the midst of a divorce tell me that they couldn't say "for sure" whether God actually thought that leaving one's spouse because "it isn't working" is wrong. So many don't know the truth, or -- simply don't want to know it. I echo what your the other comment writers have said - great, thought-provoking post. I thought the CT interview was really telling and the same sentence grabbed me. When I read it, I heard "I don't know and I don't want to know because I don't want to obey." If we LOVE God, then we will want to know what He thinks of our life/behavior and not bury our heads in the sand. I love my spouse and if he hates peas, I want to know it and avoid making pea soup for him. Yes, many American Christians don't have a strong theological base. But the deeper issue seems to be a lack of love for God that makes them interested in knowing what He thinks. Interestingly, Knapp wanted to make it about Christians rejecting her as "worthless." (CT ran some great responses that hit this one on the head.) I think she knows better. She wants us to affirm her sin, not her. Christ died to redeem her. And me. And you. We are not worthless. But neither should we stumble around saying we don't know what is sin and not sin. We should find out. And live in the grace that has been lavishly poured out on us. Rachelle - AMEN to that! Thanks for that thought-out comment. Amen and THE TRUTH will set her free, and all of us. amen, sister. I am not familiar with Jennifer Knapp, had not heard of this announcement, and had not read the article until now. I find it sad that it appears her relationship with the Lord seems to be so outwardly-focused: "... they're still seeking to be Christians but not always measuring up to the marketed idea of who they should be." It seems that altho she's seeking to express herself honestly, where she's at, she is NOT seeking God's face. It is also sad that she perceives (probably validly) many believers as being judgmental, rather than experiencing those folk aiming to come along side her as fellow-sinners, at the foot of the Cross. I think what Jen did was incredibly brave and will hopefully pave the way for freedom for more GLBTQ Christians. Coming out was a courtesy, she's no longer with a Christian label and I see it as an act of love towards people who might have listened to her music and later felt betrayed as she mentioned in her interview with Advocate. And the interviewer was a bit antagonistic, calling it a lifestyle choice from the get-go. But I will offer, in her place, to discuss why I think GLBTQ Christians are being forced to shoulder an unnecessary burden of shame and chat about different ways of interpreting the Bible. Carrie, you've said this so much better than I ever could. Thank you for this thougtful and though-provoking post. You are right that many Christians and many churches focus only on God's love and mercy and not on His holiness and justice. The Bible says we are to be holy as He is holy. Of course, we all sin, but when we do we must confess that we have sinned, ask forgiveness, and change our behavior. Our priest says, "admit it, quit it, and forget it." But we can't justify sin just because it's something we want to do. Wow. This is such sad news. That statement you quoted is so telling. Not just sad as to her relationship with the Lord, but sad as to her Church's relationship (pastor's relationship) with the Lord and the Bible. 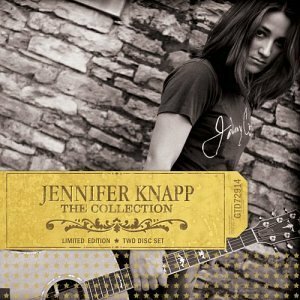 Jennifer Knapp was my all time favorite christian singer ever, and I know so many of her songs that I have loved and cherished and sing to this day with my guitar. You could feel her heart and conviction when she would cry out to God during her music and is a prolific writer and excellent guitarist. I always thought it odd that she disappeared from the christian music scene and did not fulfill her contract with the label she was with. I imagine this news became known to them and it became mutual to have her move on in light of her lifestyle. I do not however sit here in judgement of her. And I think that this is a sin like any other sin as I have seen pride, gossip, backbiting, lying, cheating, lust and every other sin in the church. It was probably best that she moved to a non-christian label. When someone is in a position of ministry and representing christianity and God, they are held to a higher standard. Ultimately, the decision she made is between her and God and I don't believe this decision has condemned her to hell by any stretch. God does not just take back salvation, and God is not surprised by this event. There is always room for improvement for all people and we are sinners and sin all the time. It is only the blood of Jesus that keeps us from hell. My comment to leave with is this will have a huge impact on younger America who are being taught that it is OK to be a lesbian/gay at school, and she will be looked at as a role model for those struggling with homosexuality and a hit against the church and christians who try to speak against her decision to openly confess her lifestyle. But making this a point to press I do not believe is a right move on her end. She will not be blessed by God in her stance, although the world may give her praise for it. There's a book I'm about to get into (I got it for review) called "On Guard" by William Lane Craig. It's all about Christian apologetics (defending our belief -- knowing how to say WHY we believe what we do). And, I think it's a timely and much-needed resource! I hope more people will read it so that all of us can "be prepared to give an answer to anyone who asks you to give a reason for the hope that you have." (1 Peter 3:15). Fantastic response. I would only add that, yes, salvation is God's incredible gift, which should engender gratitude and obedience. But there is more, isn't there? To obey God is to maximize our own joy. In other words, denial of the fleshly self is actually the road to true happiness. Sin that hasn't been confessed and repented of tears us up inside and robs us of joy. So, really, the Christian life involves denial of lesser pleasures all for the sake of the greatest pleasure: knowing God. This is not a theological abstraction- it's the real, experiential TRUTH!